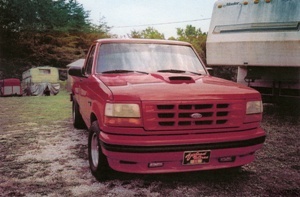 I bought my 1993 Ford 5150 Lightning in February 2008 from a used car dealer in Leitchfield, KY. Although the engine, drive train, and interior were in perfect shape, a previous owner had tried to paint it, so it was about three shades off, peeling all over the trim and windows, and had some rust over the rear wheels. I took the truck to Delbert Best in Glendale, KY in April 2008. He took the truck apart, and removed the glass, door handles, and locks. The only thing left on the frame was the engine and the cab. After taking it down to bare metal, he painted it and replaced the bed sides. He put it back together along with a hood scoop off of a 1970 Boss Mustang. While it was apart, I replaced the sending units in the gas tanks, the window motor in the right door, and urethane bushings. It was finished in October 2008. The truck is a numbers-matching original. It is number 2,273 of 5,276 Lightnings that were built in 1993. I have a certificate of authenticity from Ford, and it is fully documented. Red and black were the only colors offered on ’93 Lightnings. It has a 351 high output code R engine, a beefed up E4OD transmission, and a 4:10 traction lock rear end. It is a blast to drive and show. It ran a 14 second ¼ mile, but it only comes out of the garage for shows, parades, and to pick up trophies.